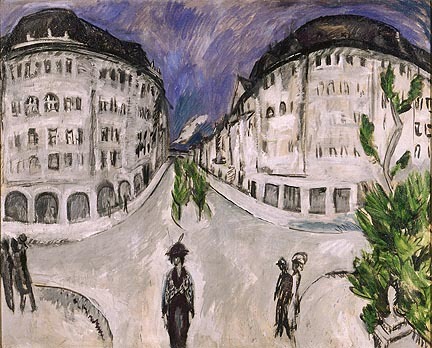 Ernst Ludwig Kirchner, Street at Schöneberg City Park, 1912-13. Oil on canvas. Milwaukee Art Museum, Gift of Mrs. Harry Lynde Bradley. Photo by Larry Sanders. Have you ever looked at a work of art for a half-hour straight? In college, one of my favorite art history professors required that we spend at least a half-hour sitting in front of the work of art we were researching and sketch it, getting intimate with the figures, setting, lines and brushstrokes within it, and immersing ourselves in the choices the artist made. While looking for forty-five minutes at Kirchner’s Street at Schöneberg City Park, that was exactly what I did. I chose this painting initially because I was sucked in by the unrealistic perspective: the two buildings swell as if under convex mirrors, the street simultaneously lies wide open and zooms into the distance. Despite the bright greens of the sparse trees, there are only a handful of people on the street, and the turbulent brushstrokes of the sky bounce across the roofs of the two buildings. 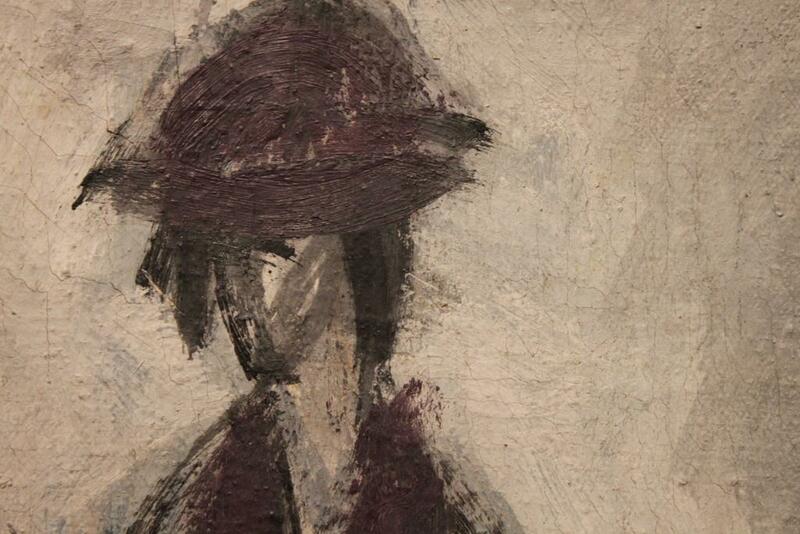 The lone woman with a hat and maroon shawl at the center of the painting faces us, her pose stiff, with arms limply at her sides: is she walking towards us, or standing still? She avoids our gaze, her eyes only a dash of black paint. Frustrated by this surreally empty street, I turned myself over to the physical qualities of the work—the paint on the canvas. Thin layers of gray strokes jostle against each other, giving it a shallow kind of texture. 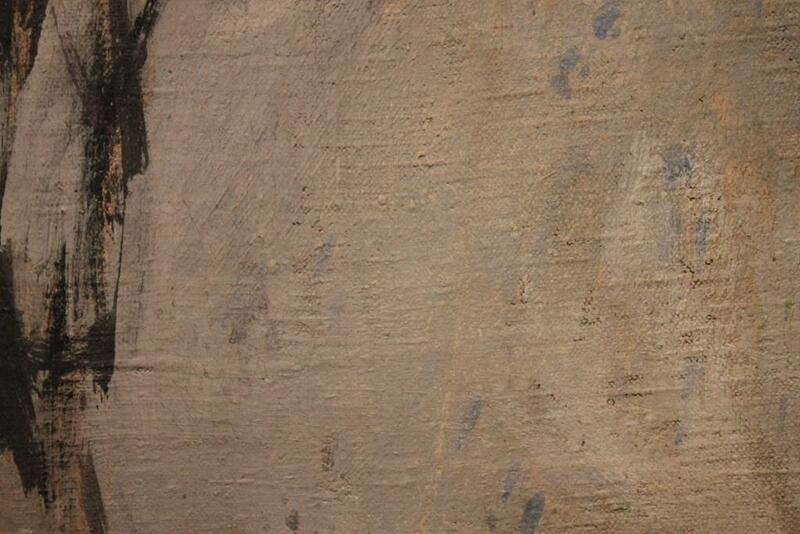 Dapples of paint dot the sidewalks nearest the viewer, like flat pebbles or raindrop stains on concrete. Windows are misted over in blurry swaths of watery white strokes. But there are some subtle uses of color, too: maroon on the roof of the right-hand building and in a dab on one of its windows, on the shawl of the solitary woman, and in his quick signature at the lower left. Meanwhile, rich, healthy greens stretch upwards in the center and lower right. And there is the rough, transparent blue of the sky above. The more I looked, letting surface and subject come together, the more I became aware of the tension and silence I felt while looking at this picture. The movement of the sparse clusters of hurrying figures and the vibrating brushstrokes of paint clash with the stationary buildings and largely empty streets. The quadrants of the painting—two swelling buildings at the top and the curving sidewalks at the bottom—frame a vacant center, knocking the viewer off balance. This is a silent world: no evidence of conversation, except perhaps hushed whispers between the figures; no bustling shop noises, only soft taps of shoes on pavement; no cars, buggies, or animals, though the leaves might rustle in the air. A few days later, I poked around in some books and discovered that Kirchner painted this work when he moved to Berlin in 1911. It marked the beginning of a series of paintings he made about city life (one of which, Street Scene, is hung right next to Street at Schöneberg City Park). He was a founding member of the German artist group Die Brücke (“the bridge”), who paved the way for Expressionism, a style of art that rejected realistic depiction in order to represent emotion. For me, this painting exemplifies that city feeling I love: when you are in a huge, sprawling city, which you know is full of people, but which simultaneously feels desolate and lonely and quiet. Visit this painting in the Museum’s Bradley Collection and share your thoughts: How does your eye move through this painting? What memories are sparked for you? 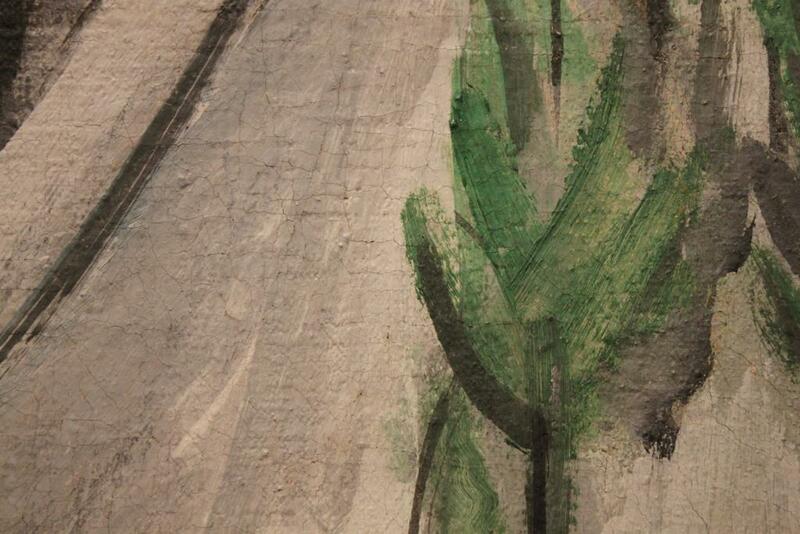 What details of the painting draw you in and hold you there? This entry was posted in Art, Education and tagged 20th century art, Bradley Collection, Die Brucke, Ernst Ludwig Kirchner, German Art, Slow Art. Bookmark the permalink. I also think I could look at this painting for half an hour. There are paintings that I enjoy visiting time and again because of the mood they evoke or the stories one can imagine while reflecting on the artists choices or the world they created. Here, I imagine the scene to be dinnertime and all the busy city workers have rushed home to be with their families. Meanwhile, our protagionist in the foreground is comforted by the new silence of the evening – as she walks down the center of the road she glances down with a gentle exhale. Perhaps slightly tired from a long day, the slower pace of the twilight hours and the contrast she notes in the sounds vs the clamor of day, is reassuring to her. Maybe they are closer to the sounds from home, but regardless – this is her favorite time of day in the city. Hi Carly! I love your beautifully written thoughts about this piece… especially your interpretation that it’s not necessarily something dark, like I wrote, but something that could be peaceful and comforting instead. Thanks so much for posting! Oil paints are a great medium of art which has produced some of the greatest artists all over. If one is willing to buy oil paintings, it becomes essential to know at least the biggest artists of all time and their works in order to differentiate between a great painting and cheap paintings.